Here we will discuss about internal and external division of line segment. Let (x₁, y₁) and (x₂, y₂) be the cartesian co-ordinates of the points P and Q respectively referred to rectangular co-ordinate axes OX and OY and the point R divides the line-segment PQ internally in a given ratio m : n (say), i.e., PR : RQ = m : n. We are to find the co-ordinates of R.
Let, (x, y) be the required co-ordinate of R . From P, Q and R, draw PL, QM and RN perpendiculars on OX. Again, draw PT parallel to OX to cut RN at S and QM at T.
Let (x₁, y₁) and (x₂, y₂) be the cartesian co-ordinates of the points P and Q respectively referred to rectangular co-ordinate axes OX and OY and the point R divides the line-segment PQ externally in a given ratio m : n (say) i.e., PR : RQ = m : n. We are to find the co-ordinates of R.
or, (m - n)x = mx₂ – mx₁ + mx₁ - nx₁ = mx₂ - nx₁. 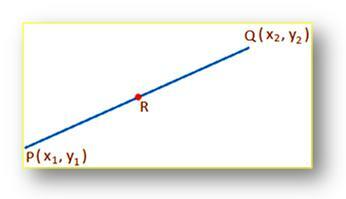 Let (x₁, y₁) and (x₂, y₂) he the co-ordinates of the points P and Q respectively and R, the mid-point of the line segment PQ. To find the co-ordinates R. Clearly, the point R divides the line segment PQ internally in the ratio 1 : 1; hence, the co-ordinates of R are ((x₁ + x₂)/2, (y₁ + y₂)/2). [Putting m = n the co-ordinates or R of ((mx₂ + nx₁)/(m + n), (my₂ + ny₁)/(m + n))]. This formula is also known as midpoint formula. By using this formula we can easily find the midpoint between the two co-ordinates. 1. A diameter of a circle has the extreme points (7, 9) and (-1, -3). What would be the co-ordinates of the centre? = ((7 - 1)/2, (9 - 3)/2) = (3, 3). 2. A point divides internally the line- segment joining the points (8, 9) and (-7, 4) in the ratio 2 : 3. Find the co-ordinates of the point. Therefore, the co-ordinates of the required point are (2, 7). [Note: To get the co-ordinates of the point in question we have used formula, x = (mx₁ + n x₁)/(m + n) and y = my₂ + ny₁)/(m + n). 3. A (4, 5) and B (7, - 1) are two given points and the point C divides the line-segment AB externally in the ratio 4 : 3. Find the co-ordinates of C.
Therefore, the required co-ordinates of C are (16, - 19). x = (mx₁ + n x₁)/(m + n) and y = my₂ + ny₁)/(m + n). In the given problem, x₁ = 4, y₁ = 5, x₂ = 7, y₂ = - 1, m = 4 and n = 3]. 4. 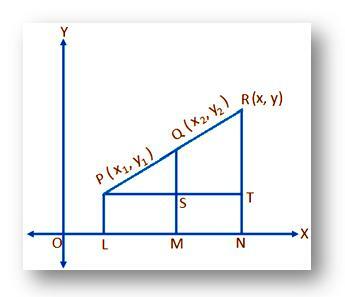 Find the ratio in which the line-segment joining the points (5, - 4) and (2, 3) is divided by the x-axis. Let the given points be A (5, - 4) and B (2, 3) and x-axis. intersects the line-segment ¯(AB )at P such that AP : PB = m : n. Then the co-ordinates of P are ((m ∙ 2 + n ∙ 5)/(m + n), (m ∙ 3 + n ∙ (-4))/(m + n)). Clearly, the point P lies on the x-axis ; hence, y co-ordinate of P must be zero. Therefore, the x-axis divides the line-segment joining the given points internally in 4 : 3. 5. Find the ratio in which the point (- 11, 16) divides the '-line segment joining the points (- 1, 2) and (4, - 5). Therefore, the point (- 11, 16) divides the line-segment ¯BA externally in the ratio 3 : 2. 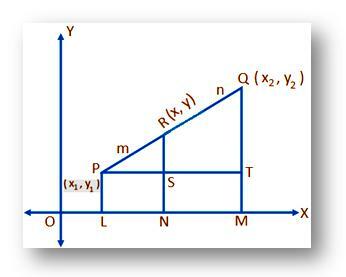 [Note: (i) A point divides a given line-segment internally or externally in a definite ratio according as the value of m:n is positive or negative.